The World Health Organization (WHO) considers electromagnetic radiation frequencies and all UV frequencies potentially carcinogenic and recognizes that they cause damage to biological systems, since the radiation they contain produces ions and free radicals in living tissues. Quantum Science EMR (electromagnetic radiation) and EMF (electromagnetic frequencies) shields reduce human exposure to harmful radiation from electromagnetic fields and protect humans from harmful health effects caused by sun exposure, radio waves, and the daily use of devices that emit EMR and EMF. 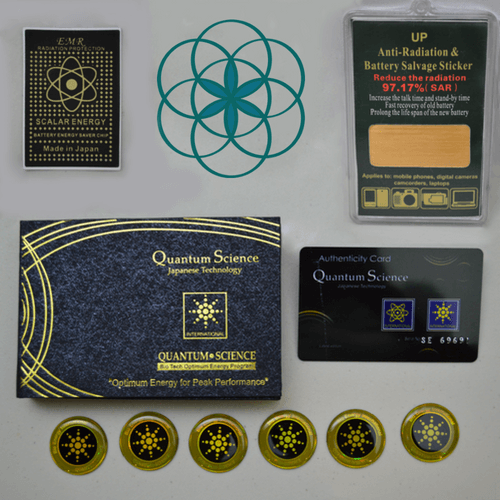 Quantum Science EMF shielding and anion devices neutralize poisonous positive ions by using minerals and stones. They are often combined with scalar energy devices that improve the body's electromagnetic field by interacting with DNA. Scalar energy devices help increase body cell voltage to the ideal 70-90 millivolts.